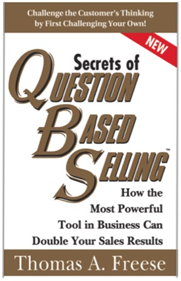 Thomas A. Freese’s first book, Secrets of Question Based Selling, represents a tectonic shift in traditional sales thinking. While sales training programs have historically focused on defining the steps of the sales process, it turns out that just identifying “what to do” provides no advantage over competitors who also have a sales process in place, as it’s likely their process is very similar (if not identical) to yours. So, rather than just continually rehashing the sales process, the QBS methodology was specifically developed to teach salespeople and entire sales teams “how” to execute more effectively. There’s a reason top salespeople in every industry (and within every company), are outperforming their struggling counterparts, even though they’re all following the same sales process steps. In a strategic sale, companies cannot offer valuable solutions until the potential buyer recognizes the existence of a need. Identifying more needs also gives you more opportunities to provide value. But, just because a salesperson wants to ask a bunch of questions, doesn’t necessarily mean today’s skeptical buyer is going to openly share information with every salesperson who comes calling. While customers tend to focus on ROI (return on investment), sales teams should be equally focused on their ROISE (return on invested sales effort). It’s no longer enough to probe for needs or ask a series of qualifying questions on the way to fulfilling a customer’s goals and objectives. Asked strategically, questions become a salesperson’s best tools for piquing the customer’s interest, gaining credibility, navigating to the right people, increasing the customer’s sense of urgency for making a decision, and securing next steps in the sales cycle. Thus, the real skill moving forward is knowing HOW to cause potential buyers to “want to” engage in a productive conversation (with you) about their needs and your potential solutions. Organize those conversational tools and interpersonal skills into a cohesive and repeatable sales methodology, and the core concepts of Question Based Selling stand alone as the highest rated sales effectiveness training your sales team will ever experience.